Vores Jewel Apartment er et charmerende 2-værelses, 2-badeværelse lejlighed lige i centrum af Budapest, lige ved Andrassy Avenue og tæt på operahuset. Lejligheden blev totalrenoveret i 2015, så dens helt nye. Lejligheden er meget rummelig med 93m2. Det store soveværelse har sit eget en-suite badeværelse med bruseniche og et separat walk-in garderobe. Det andet soveværelse har også fået en walk-in garderobe og der er også en anden, familie badeværelse med badekar og vaskemaskine. Der er også et separat toilet. Køkkenet er fuldt udstyret med opvaskemaskine, mikroovn, brødrister, kedel og endda en Nespresso kaffemaskine. Den separate spisestue med plads til 6 personer. Du vil også finde en rummelig stue med en dobbelt sovesofa, så lejligheden kan rumme 6 personer komfortabelt. Vi tilbyder gratis WiFi for vores gæster. Lejligheden ligger på første sal, og der er ingen elevator i bygningen, men vi vil hjælpe dig med din poser. This apartment met and exceeded all our expectations. The two bedrooms were large with plenty of space to spread out and suitcases could be stored in the large adjacent walk-in closets. The high ceilings gave the apartment an airy feeling and it was pleasant to return home after a full day of touring. Tamas – the property manager – was the consummate professional, our emails were responded to promptly, and our airport transfer went smoothly. It was a relief to see my name after 18 hrs of travelling and reporting a lost suitcase. Tamas met us at the apartment, gave us a tour along with three sets of keys and a binder which provided great information. The apartment is fairly large and the two bedrooms are located at each end of the apartment. The kitchen was well equipped and the knives were sharp (dull knives is a pet peeve of mine). There were several grocery stores nearby – a Spar is located less than a 10 minute walk away. This may seem like an odd observation but there were plenty of plugs located throughout the apartment (necessary if four people were to remain “plugged-in during their travels) and an umbrella was available for our one rainy day – I had packed one but it was in the “lost” suitcase. The location is ideal, right in the centre of most of the major sites. The House of Terror, Opera, Hero’s Square Cathedral… were all within a 15 minute walk. As an aside, it is worthwhile to take a tour of the Parliament but make sure that you pre-book a time to avoid the long waiting time. During our five night stay, we exclusively used public transport which was very convenient. Tamas’ office is located nearby, just across the street from the Opera should you require any assistance. Overall, our stay at the Jewel apartment was comfortable and it comes highly recommended. The only negative comment – one of the bedrooms overlooks the street which can be very noisy in the evenings. If you are a light sleeper, or unaccustomed to street noise, it may be difficult to get a good night’s rest. This is the only reason I did not give this apartment five stars. Spacious apartment - close to it all! We had a fantastic week in the Jewel apartment. The apartment is spacious and is very clean. Though the street looks initially a bit run down, the location is perfect as it is close to the Opera. We could do all visits by foot! And underground parking is next door. Tamas and staff have been very responsive and we've felt welcome all along! An absolute recommendation for anyone interested to visit Budapest for a week or so. I give the place 5 stars. Great location. Very well furnished. Comfortable beds. Spacious. 2 bathrooms. Good water pressure. l'appartamento é piacevole. Vicino al centro cittá e dunque a tutti i servizi. 3 note molto negative: free we fi inesistente , mancavano le lenzuola nei letti, il caldo insopportabile dovuto non tanto alla temperatura della città quanto alle finestre sempre chiuse poiché non c'erano zanzariere. Il gestore dell'agenzia non ha mai risposto alle richieste di possibile soluzione dei problemi. L'assistente é apparsa alquanto inadatta a fornire adeguate spiegazioni. Excellent stay at the Jewel Apartment in Budapest! 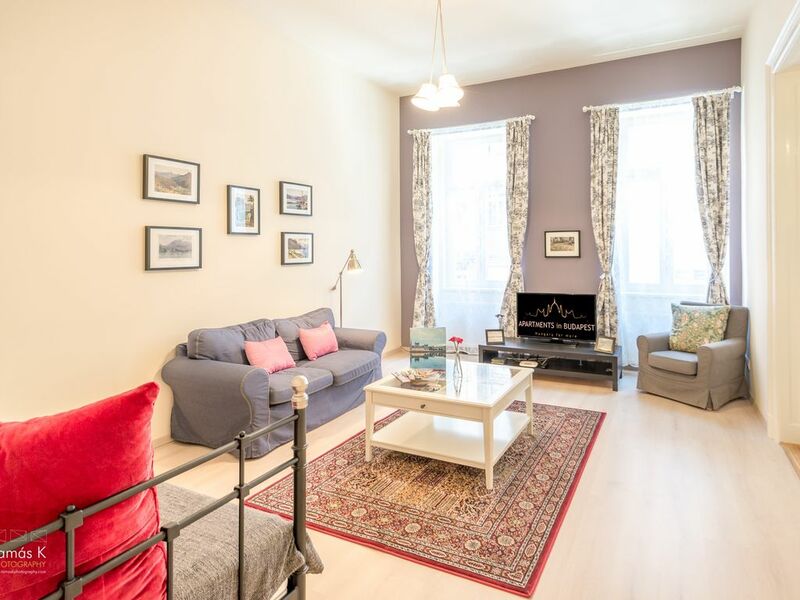 The apartment was centrally located in Budapest, with easy access to all major sites. It was a great layout, everything was new and clean. Tamas and his team could not have been friendlier and more attentive to our needs. A great choice for Budapest! Thank you very much for choosing us and I am very happy that you had a great time in Budapest and in our brand new apartment. Hope to see you soon again. Dessewffy Street ligger lige i centrum af Budapest. Det er blot et par minutters gang væk fra Andrassy Avenue og operahuset.